Upswing Poker Lab Review : The Best All Round Training? To be the best at anything in life, learning from the best is usually a pretty good start. Unfortunately, we don’t always have access to these individuals. Imagine firsthand being able to learn golf from Tiger Woods, basketball from Michael Jordan, or football from Tom Brady. Well, Doug Polk is their equal in the poker world. Fortunately for the aspiring poker player, he has a poker training site called Upswing Poker and the Upswing Poker Lab is where he fills you in on all of the poker strategies he uses to crush his opponents! I recently ranked upswing poker as the third best poker training site on the market in 2018 behind two tournament training options on a very competitive list. However, in my opinion, the poker lab tops the list with regard to becoming a well rounded poker player in all game types, particularly for players who are in the low and microstakes. A common theme amongst poker pros/savants/experts in their respective fields is that they don’t always translate into great teachers. After taking Upswing’s Poker Lab Course we can unequivocally say this isn’t the case. The course starts with most basic of concepts, systematically putting one more tool in your poker arsenal at a time all the way through to the most advanced concepts. In my opinion, this course alone can take a complete amateur poker player and turn them into a winner at low stakes in a month or two. Is The Upswing Poker Lab Worth It? Not only do you get to learn from Doug Polk, but also his Upswing business partner and fellow poker crusher Ryan Fee. They are pokers version of Lennon and McCartney. Fried Meulders and Parker “tonkaaaap” Talbot have also added content to the course recently, mostly in the form of play and explains and tournament play. Upswing’s course is a comprehensive guide that is a combination of the skills they have both attained over countless hours studying in the lab and on the felt crushing the highest nosebleed stakes possible both live and online. In this review, we are going to specifically look at Upswing’s Poker Lab. Upswing also offers excellent courses on PLO, Tournament Poker, Heads Up Mastery, and Mixed Games if that is your forte. The Poker Lab is going to be the best starting point for your Average Joe, or anyone simply trying to improve their No Limit Hold’em Poker game. The nice thing about the Poker Lab is it also has a section that brushes up on Tournament Strategy and live poker play. Basically, you will be getting a little bit of everything with this course. This course is guaranteed to create a well-rounded poker player (if you put in the work of course, this is not a magic pill!). Let’s take a deeper look at what you can expect to find in the Upswing Poker Lab. Upswings Poker Lab is awesome because it starts with the basics and progressively works its way up to the more advanced concepts. Each concept builds upon the next. The course is formatted in a way that is easy to navigate and follow. You can easily go back and rewatch segments, or easily skip ahead if you already find yourself competent in certain areas. Terminology – This is going to be a section mainly for new players. Here you will learn all of the essential terms from the various positions on a poker table, to the various kinds of bets and more. Matrices – Knowing what a hand matrix is and how to properly use one is HUGE! A large part of being a winning poker player is properly ranging your opponents on hands. 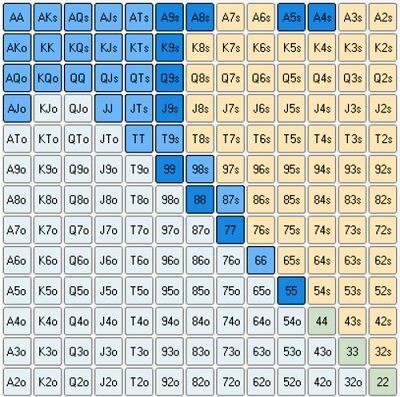 A hand matrix is how we build and visualize these hand ranges. Here Doug will teach you how to understand a Hand Matrice and how to properly apply it. Ranges – This is a perfect example of how Upswings course pieces itself together like a set of building blocks. Once you have a good grasp and visual of what a 40% BTN opening range is, for example, we can then start to construct our opponent’s range of potential holdings. In this section, Doug will show you how to properly apply this in game. He also delves into some more advanced range concepts such as Capped Ranges, Polarized Ranges, Linear Ranges, and Merged Ranges. The Four Categories – This particular concept is a staple and unique to Upswing Poker. It is a great example of Doug Polk and Ryan Fee’s genius and a brilliant way to simplify every spot you’re in at a poker table. As you can imagine by the title, they break down all of the holdings in your range into Four Categories, with a general guideline on how to proceed with each categorical hand. Doug will give you examples of each categorical hand and examples of their application in game. 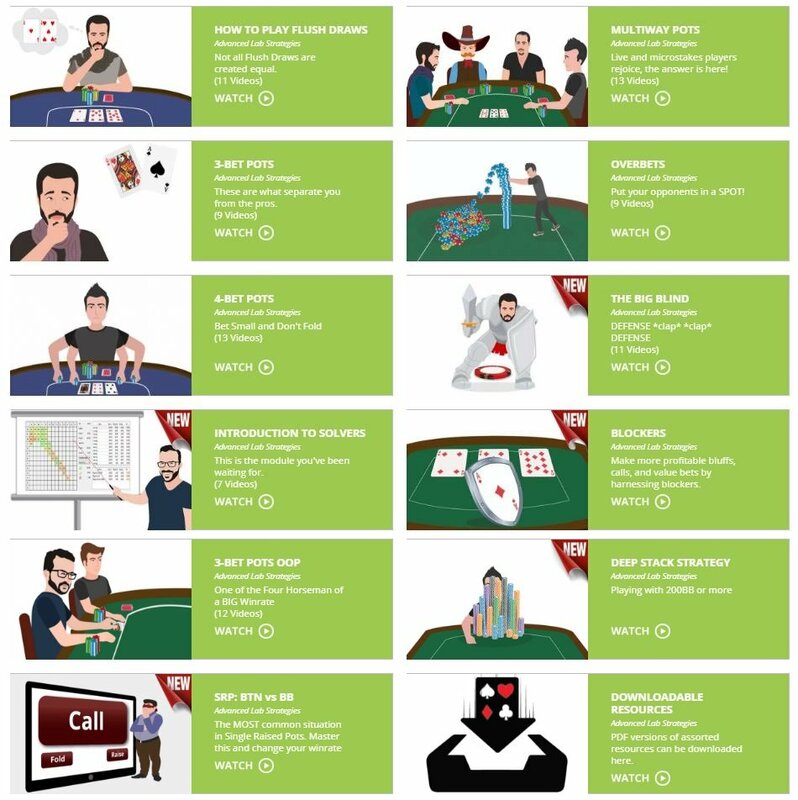 Once you get through all of these sections in the Poker Lab 101, you still have 5 modules to go! Upon completion of the core modules, you can move onto the advanced strategies which will add higher level thought to your poker game. Poker is a complex and as a result is very difficult to teach but, in my opinion, Doug and Ryan have done an excellent job in taking difficult concepts and making them easy to digest. Some of the advances strategies covered in this module are shown below. My favourites are definitely the first set of lessons “How To Play Flush Draws” (as you get 20 easy to follow rules which make playing flush draws MUCH easier) and the overbetting lessons. Overbetting is my go-to strategy that I found helped me exploit a lot of unsuspecting fish and regs – I even wrote a post on it a while back– Doug explains the topic very well and I love his analysis of the 5♦3♦ hand where he gets owned making a 4x overbet shove on the river by a light call down (both players actually played the hand really well). If you are a break even player in the microstakes, the strategies outline here will be really helpful. There are 11 modules in total in this section plus a downloadable resource section which adds up to quite a lot of content for you to sink your teeth into. 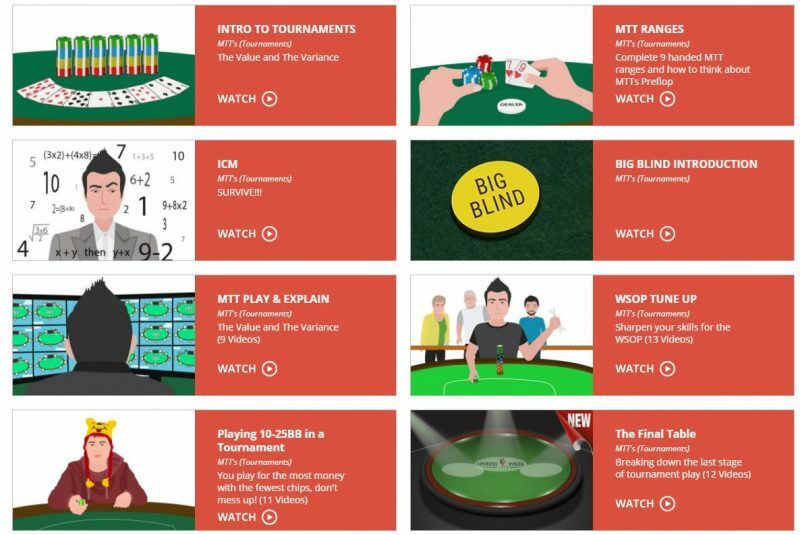 In this section you get an intro to playing tournaments, starting hand ranges, ICM, big blind introductions, navigating 3bet pots, play an explain tourney hands and WSOP tune up videos (plus more). You will also get 12 videos on final table play which is mainly produced by Parker Talbot which goes into a lot of detail on the minute of of playing within the last 9. This is good starter pack for anyone who wants to play tournaments as it covers all the basics out tournament poker strategy. Here you get play and explain hands, the truth about high stakes poker, the upswing live poker approach and a deep dive into live tournament dynamics. 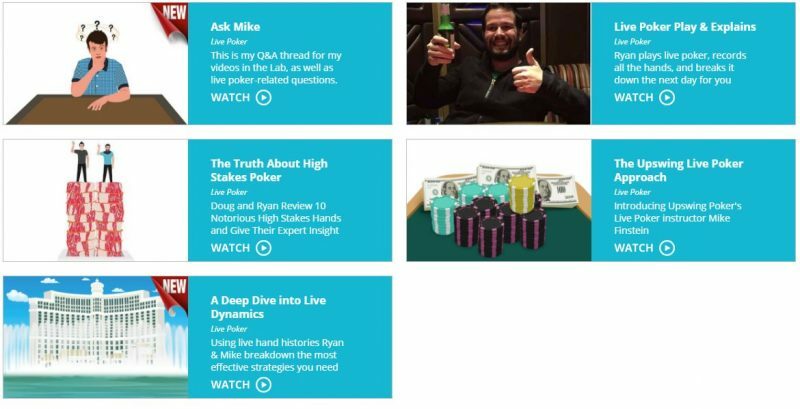 You can also post in the “Ask Mike” thread where you can ask your live specific questions and have them answered by the resident Live Poker Pro Michael Finstein. 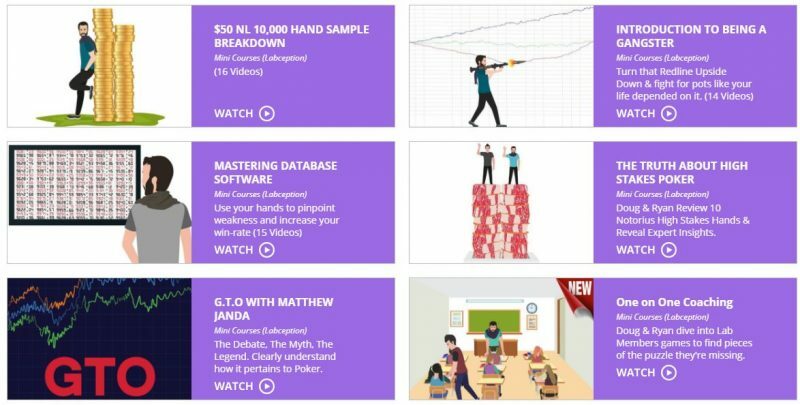 In this section you will find bit sized courses on hand breakdowns of small stakes play, introduction to being a gangster (red line play), mastering your database and GTO play with Matt Janda (awesome poker player and poker author). Redlines are the enemy of online players who are trying to play a tight aggressive (TAg) like game – all you have to do is search “redline poker” into google to see all the content that has been written to tackle this problem. Well I really like the way they attacked this problem in the mini-course where they look at specific examples of how to take down more pots without seeing showdown – essentially being more aggressive in the right spots. The one on one coaching section is also very helpful as it highlights some of the common mistakes other students in your shoes are making. Lastly, play and explain videos where you listen to Doug, Ryan and other pros break down their thought process throughout real poker hands. Find out exactly how top players think and analyse hands. 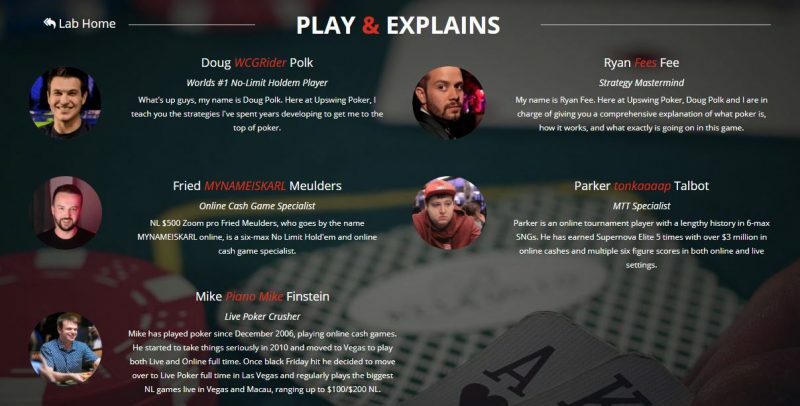 Since my last look into the course, a lot more content has been added – so I have to say I am truly impressed with the upswing poker lab and it’s continual development. You can do the same for all positions, as well as facing 3bets from each of the positions, facing raises and cold 4bets. So it practically covers all basis for 95%+ of the situations you will come across preflop. I cannot state how handy this is for a new player who has no intuition for which hands they should or shouldn’t be playing. These charts are a great starting base from which to work from as the tell you exactly what hands you should be playing as a default. “Default” is key here. You shouldn’t play exactly these hands on every table. It should be adjusted based on the table conditions (such as a bad playing in the blinds, where you would open more often) – but to adjust, you do need a starting point which is the exact purpose these charts serve. 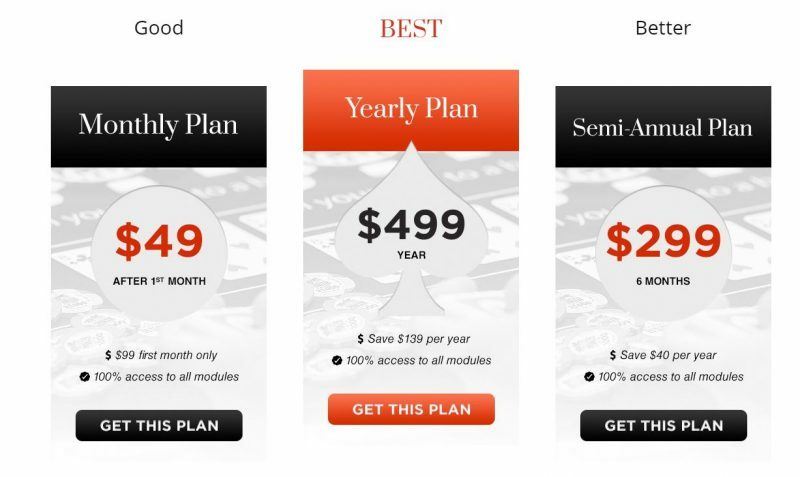 When looking at the cost of a poker training site, it is important to think of your Expected Value. One small leak in your game could amount to the cost of Upswings course in losses just over the course of a few sessions. If you can commit to working through all of the content in the poker lab you will exponentially be saving yourself money in the long run and making a great investment in your future. Upswing offers some different plans, so evaluate which one looks best for your current financial situation and proceed accordingly. Click here to find out more about the Upswing Poker Lab. As a connoisseur of poker training sites over the years, we can without a doubt say we endorse Upswing Poker here at Howtoplaypokerinfo.com. If you have ever watched any of Doug or Ryan’s YouTube Videos, it is easy to see how passionate and knowledgeable they are about the game of poker. They are extremely dedicated to their craft and very prideful in putting out high-quality content. Doug and Ryan’s resumes speak for themselves and validate the fact that they are well qualified to be your poker coach! Just last summer Doug won the $111,000 Buy-In One Drop Tournament in the WSOP 2017 for 3.7 million. Ryan has nearly 3.1 Million in Tournament cashes, and they are both widely regarded amongst the best Cash Game players in today’s game. A huge bonus to purchasing The Poker Lab course is that you are also invited to be a part of Upswings private and exclusive Facebook group. Here you can get one on one interaction with Doug, Ryan, and other Upswing team members. I am a member of this group and it is very helpful, especially for new players to the game where you have access to over 3000 other members of the lab. Post your hand histories for review, or any questions and concerns regarding the course and they are usually pretty prompt with their replies! It also gives you a chance interact with other Upswing students which can be an incredibly valuable resource in itself. “I just wanted to say how amazing Upswing Poker is. I’ve been both at Tournament Poker Edge and Run It Once before and both investments paid off for me but you guys are just on another level. I love the systematical approach of the modules rather than giving a bunch of tips in videos on how to play your specific hand. This actually made me understand WHY some of the plays I’ve been already making and that seemed obvious, are actually the best plays, and this way of understanding how the game tree actually works that no other training site came close to before, has given me endless value in the exploitative part of my game. It also blows my mind that two absolute legends of the game take the time to answer specific hand questions here daily. Keep it up, you guys are changing the training site game entirely. “Brag post for my 25NL results! Last year I was a losing player, and in December bought an Upswing subscription. I completely reinvented my strategy and since January 1st I’ve been posting some very decent results. I have a long way to go in terms of refining my strategy and ramping up my aggression(especially on the River), and learning to play more tables, but I wanted to thank you guys very much. This group has added just as much value as the modules themselves. The course is very consistent and comprehensive, and is very easy to follow. The courses focus on balanced ranges and having a well thought out gameplan. 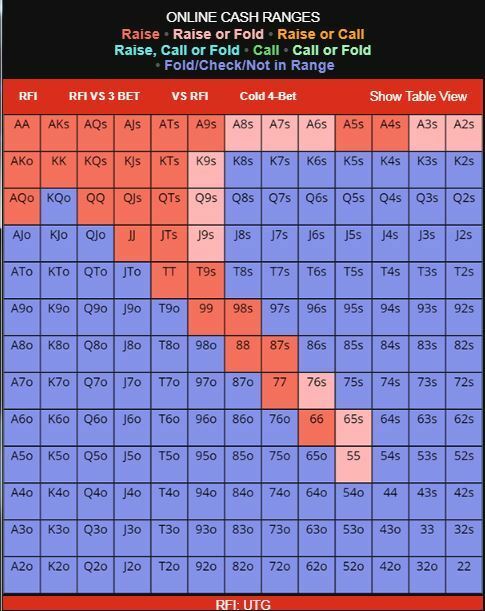 Range viewers to tell you exactly what hands you should play from each position which is great for a beginner. 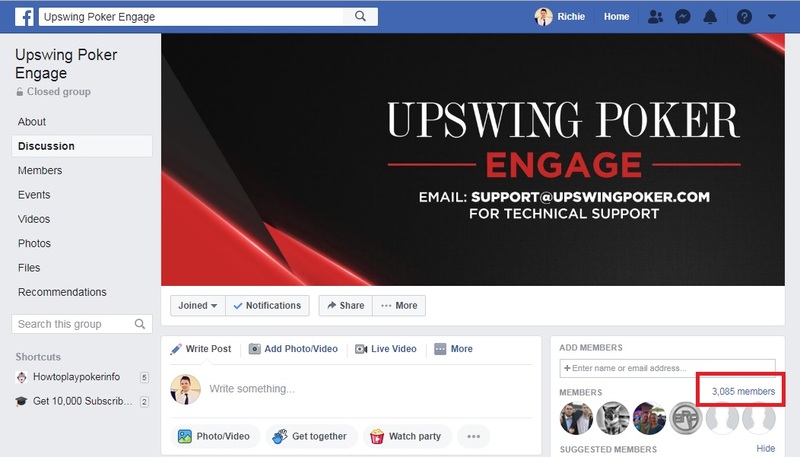 The upswing poker engage facebook group where you can post hands and ask questions. Doug is an excellent teacher and very entertaining to watch – although he has taken a back seat with content production recently. This course won’t specialise you in any particular game type you may need further training after you have decided on what format you want to focus on, e.g. MTTs, cash games). No access to content before signing up such as you would get with a free trial. Doug is taking a back seat recently with content production leaving most of it to Ryan and others. In summary, the Upswing poker lab is a great opportunity to elevate your overall poker game. The combination of Doug Polk and Ryan Fee have created an awesome course which will make you a well-rounded poker player (once you put the work in – no poker training is a magic pill!). Get $25 off the Lab (monthly, semi-annual or annual) using Upswing Poker Lab discount code PLAYPOKER2. Click here to find out more about the Upswing Poker Lab and take advantage of $25 discount. Best of luck on the felt! Free Trial or Money Back Guarantee: No details on a returns policy, so you must content support if you would like to get a refund for any reason. Content Organisation: No issues with organisation. Everything is very easy to find and follow even as a beginner. Content Depth & Comprehensiveness: Good content depth, lots of topics covered with great detail. Video & Audio Quality: Initially had issues with the quality of some videos but these have now been resolved.